U-PICK — Fresh from our fields to your home. 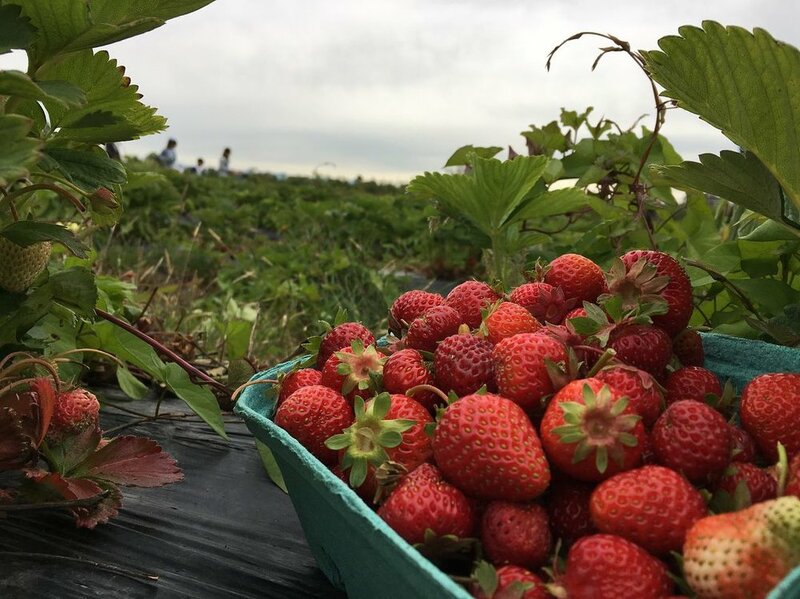 To avoid disappointment, please call ahead for availability at 604.574.1390 to ensure U-Pick is open as U-Pick fields are subject to field availability and supply. Strawberry, Blueberry, and Raspberry U-pick fields are open during the berry season as they become available and depending on weather conditions. We have multiple fields of each berry and U-pick areas are moved depending on supply to ensure that guests are in the best areas for picking. Bring your own buckets/Tupperware or purchase a Surrey Farms container for $2.00. Please dress appropriately for the weather, as there is little shade. Remember water, hats and sunscreen! We will weigh you containers before you head out to the U-Pick field. Once you have picked the berries we will then subtract the weight from your total cost. Once you have filled your container, please have them weighed at the market. Berries should be purchased before eating. Once you have picked your berries, and have had them weighed, please enjoy! Keep in mind that size does not determine taste. The small berries taste just as good, if not better, than larger ones. In order to comply with Canada Gap regulations and Food Safe regulations, no animals are permitted on the farm with the exception of certified service dogs. Enjoy your fresh and delicious berries! Don't forget to enjoy them right away or freeze them when you get home. Only wash your berries when you are ready to use them. Sort through the berries to make sure there are no stems, unripe berries or damaged berries in the mix. Process or freeze your berries the same day you receive them for the best flavour & quality. Berries are perishable and lose their quality quickly. Never soak your berries in water. For best results, rinse lightly and drain in a colander. Let dry on paper towel or absorbent tea towels. Spread berries on a cookie sheet after they have been cleaned and allowed to dry. Place sheets in freezer. When the berries are frozen, place them in a plastic freezer back or rigid plastic container. Mark with a date, and pop back in the freezer.